"It just doesn't add up!" we may declare, while summing up our opinion of a given piece of art. We are divided into two camps, by times: those who figure that artwork must compute, and those who feel that art is not an equation, but a reflection of the artist's own raw passion. The debate is circular, and will always come around to "beauty is in the eye of the beholder", "art is beauty and beauty is art" and other typical brawl-inducing artistic maxims. So, always trying to make our product greater than its parts, the nerds at Jaywalker calculated that we should substitute our normal human-based artwork with that by a computer. 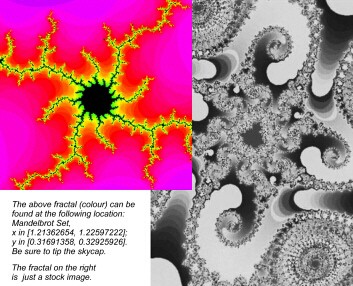 More to the point: the never-ending mathematical phenomenon known as the fractal. A fractal, roughly put, is an equation that makes lace out of space. As you know, lace is full of holes; as you also know, it has a repeating pattern. Two people following the same directions for making a piece of lace will produce identical copies. This is true of fractals. A fractal is not made of paper, however; it is made of numbers. And there can be so many numbers that you'd need a roadmap to find any given one. But given a map, anyone could find it. In other words, the fractals to your left are not as much images, as they are specific locations in an organized sea of numbers. things. To the fractal artist-explorer, the location exists, they find it, then they attach a personal meaning. Two plus two may always equal four, but to some this four is lucky, to others a reminder of sorrowful times, while still others may find it a simple cold fact. In the end, the fractal itself is a soulless and predictable calculation that is not as much created as it is discovered. This begs the question: if one does not create an artwork from their imagination, such as would be the case when painting, nor capture and bring out the beauty of a physically existing subject, such as a photographer might do - is it actually an expression, or is it really an expression by proxy? Can a mathematical statement also be an artistic statement? The fiery image you see may perfectly express that nerd's personal contempt for provincial scholarship legislation, or their feelings of deep, mathematical passion towards another computer lab technician. A given fractal may be the product of years spent roaming through the cold bits of a virtual universe; it may cause its beholders to feel they can see the soul of its creator; an artist may even point to a specific fractal location and declare with tearful honesty, "That's me! ", but is it art...?